Here’s a great piece of news that’s going to make your day: The enormous plume of smoke that’s coming out of the woods right now is probably something other people know about and have already decided is fine! Phew! You definitely dodged a bullet there. 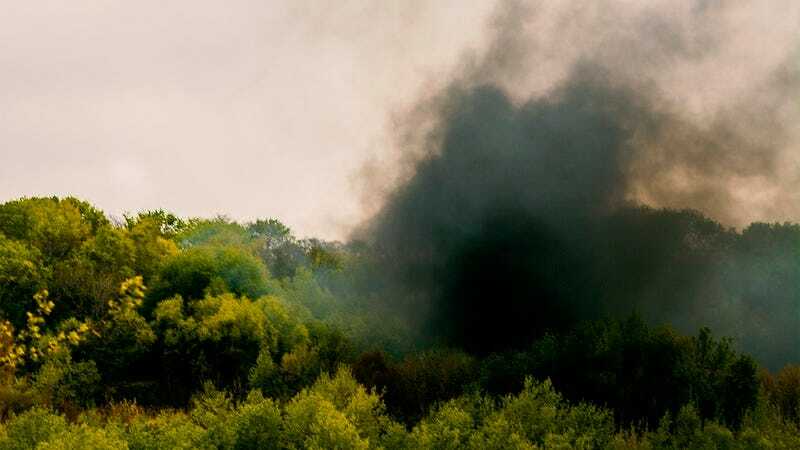 It’s hard to miss the column of smoke billowing out of the woods near your house, and if it’s that obvious to your untrained eye, you’d better believe that a forest ranger or firefighter has noticed it hours ago and taken whatever kind of action that calls for. The plume of smoke has been going steadily for 45 minutes, so they definitely would have put something on the news by now if this were anything you needed to personally worry about, which it’s not. Don’t forget that most smartphones have automatic alert systems for all kinds of disasters, so if you have cell service and haven’t heard any orders to evacuate, you’re basically good to go! Crisis averted. This area doesn’t really even get forest fires like some places do. There’s definitely someone out there whose job is to put on a loud siren in truly dangerous fire situations, and the current lack of sirens means they’ve made the call that this smoke is 100 percent A-okay. At least one expert has probably seen the source of the smoke up close by now and performed several tests, and they’ve radioed that info back to headquarters, where dozens more experts have verified that this situation is controlled and totally fine. And if it seems like there’s even more smoke than there was a few minutes ago, they’d most likely say that’s actually a good sign that the fire is starting to die out. No question about it, there’s nothing to worry about with that horrible-looking smoke. Go watch some Netflix or read a magazine or something, because this smoke is not something you need to waste another second thinking about.